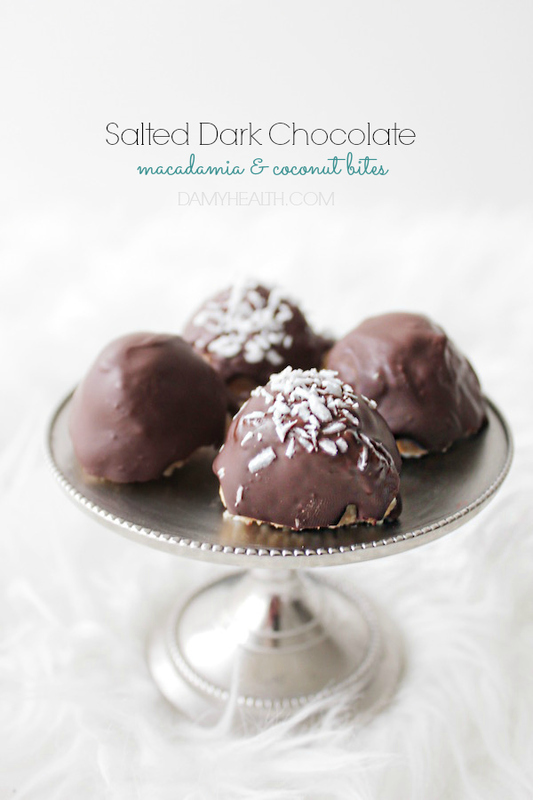 These little Salted Dark Chocolate Macadamia & Coconut Bites are sweet, easy to make and delightfully satisfying. These treats would be perfect any time of year but with Valentine’s Day around the corner I wanted to give you this wonderful recipe and remind you of some others. 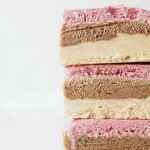 I believe creating whole-food natural treats for yourself and the ones you love is very special. Using pure natural ingredients is a way to show love to yourself and others. These are a wonderful gift, sweet treat and perfect to serve for dessert. 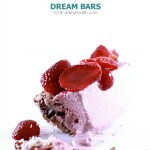 This recipe is raw, vegan, gluten free, dairy free and made with all natural whole food ingredients. 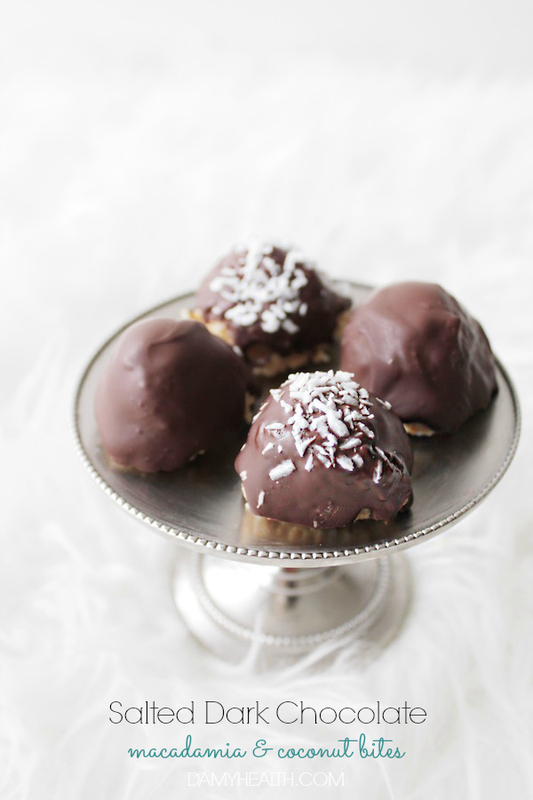 If you make this recipe or any other from the DAMY Health Blog or The Healthy Rebel App please make sure to use the hashtags #DAMYHealth & #HealthyRebel when sharing your pictures on Facebook, Pinterest and Instagram so I can enjoy your versions of my treats! Prepare our Chocolate Coating Recipe found here. (or use melted vegan dark chocolate chips). Prepare recipe but do not freeze into chocolates. Leave at room temperature. In your food processor pulse macadamia nuts until they are fine meal. Add all other ingredients aside from coconut and pulse until dough-like. Pulse in coconut until mixed without being finely blended. Line a large plate with parchment paper. Using your hands form dough into 1-inch balls. Place in the freezer for 1-2 hours. Prepare chocolate coating (directions here) or use a dark chocolate of choice (melted). Place balls on a grated cooling rack with parchment or a dish below to catch drippings. Remove balls from freezer, place on rack and using a spoon quickly drizzle chocolate evenly over the top and sides. Sprinkle each with sea salt. Enjoy immediately or place back in the refrigerator or freezer to enjoy at a later date. 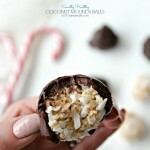 DAMY Members - 3-4 balls is a wonderful treat option. All content and photography of damyhealth.com is the property of DAMY Health and cannot be reproduced in any way without the prior written consent of Amy Layne. This includes remixing, transforming or building upon any material from damyhealth.com. All content and photography of damyhealth.com is the property of DAMY Health and cannot be reproduced in any way without the prior written consent of Amy Layne. This includes remixing, transforming or building upon any material from damyhealth.com. When trying our recipes please link our original recipe. Thank you. 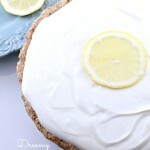 Thanks for sharing this awesome and mouth watering recipe. “I have completed the Bikini Body Program and I feel healthier than ever! I started at 159 lbs and now weigh 139 lbs. The pounds never mattered that much to me though. What am I really psyched about? My body fat percent as well as how fit and healthy I FEEL and look! I know that I now glow and light up a room with my confidence!